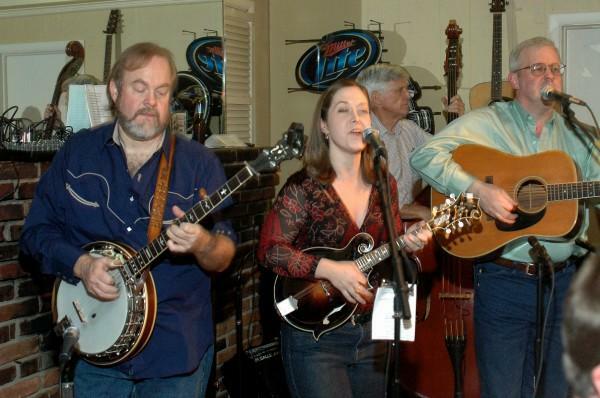 Bluegrass music has been a part of the culture at Frying Pan Farm Park for many years. Sunday jam sessions have drawn amateurs and professionals alike together to riff and harmonize on old Appalachian classics. From the cornfield to the chicken coop, the twang of the banjo and the screech of the bow across taut violin strings can be heard when the musicians gather in the Country Store. Now, the Friends of Frying Pan Farm Park are building on the farm’s bluegrass foundation with the introduction of the new Bluegrass Barn Series. Bluegrass musicians gather in the Country Store at Frying Pan Farm Park for an acoustic jam session. 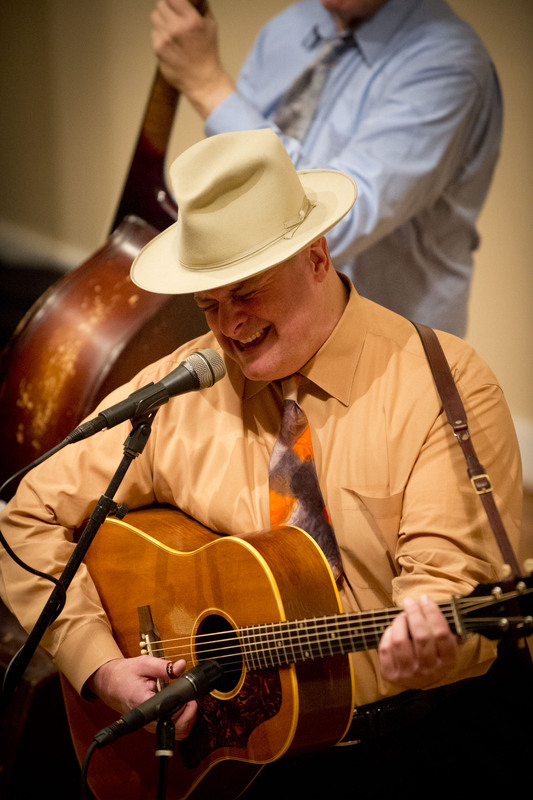 Featuring the best local and regional bluegrass talent, two-hour performances are being held every other Sunday in the visitor center’s 200-seat auditorium. David Peterson and 1946, a traditional bluegrass band from Nashville, Tenn., performed at the first Bluegrass Barn concert on Sunday, November 4, 2012. Although the audience was small, the band created at least one new fan. Kristen Auerbach, an interpreter at the farm, said, “It was a fantastic show. I’m not a bluegrass fan, but they won me over.” Auerbach said she plans to attend more concerts in the future. David Peterson and 1946 played the first concert in the new Bluegrass Barn Series at Frying Pan Farm Park. 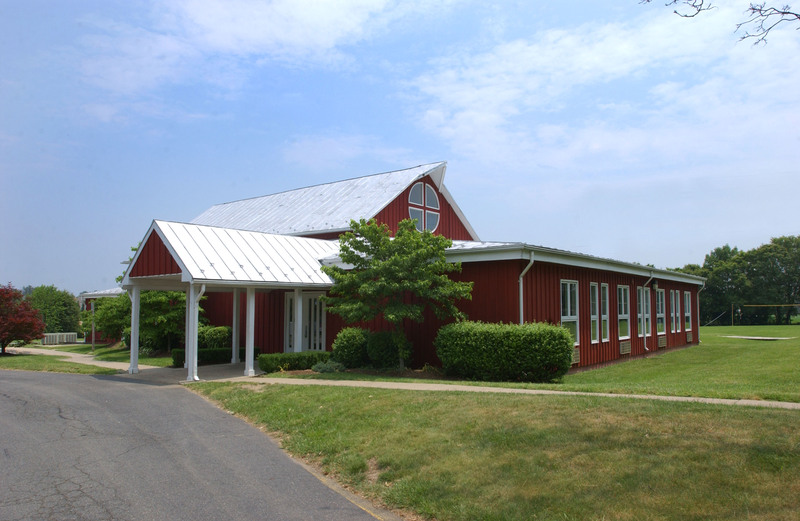 The visitor center, built in the late 19th century as a dairy barn, was converted into a sanctuary for the Chantilly Bible Church in the 1980s. 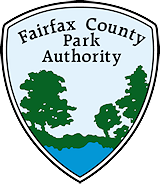 When the Fairfax County Park Authority acquired the building in 2001, it was renovated to include an improved performance space. Exposed wooden beams soaring to a height of 26 feet, hardwood floors, and a powerful sound system have made this intimate venue popular with traveling bluegrass musicians. Bluegrass Barn concerts are held in the visitor center. According to Frankeberger, a grassroots volunteer committee was formed to secure high-caliber performers to play gigs at the farm in between tour stops. The committee reaches out informally to agents and touring groups to identify possible concert dates, and then official contracts are issued once the date is secured. So far, the reaction from musicians has been overwhelmingly positive. “They are excited. For them it’s another stop along their way,” said Frankeberger. She noted that lesser known bands are anticipating an increase in their fan base in the area as more people have the opportunity to see their live shows. To tie together the new series with the traditions of the jam sessions, Frying Pan is moving the jam sessions into the visitor center from 1 to 4 p.m., before the scheduled band takes the stage. Jams, which typically draw 10-20 musicians, have outgrown the Country Store where they’ve always met. Players are looking forward to seeing and meeting bluegrass professionals, and maybe even jamming with them in the true spirit of bluegrass. Frankeberger would also like to build relationships with local radio stations. However, the majority of the publicity will come from the committee, the Park Authority, the Friends, and the performers. “It’s going to take a year or two to establish the series,” Frankeberger said. In the meantime, she’s asking all the bluegrass fans out there to help spread the word. Don’t miss the next concert in the Bluegrass Barn Series! 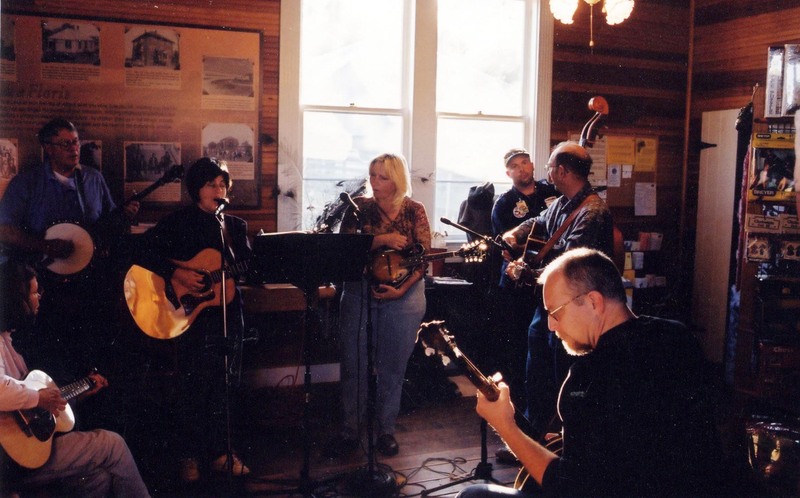 Appalachian Flyer takes the stage on Sunday, November 18 at 7 p.m. This five-musician band from Ellicott City, Maryland has been picking from D.C. to West Virginia since 2007. Bring your appetite! The park’s food vendor, Gordon’s Grille, will be selling barbecue sandwiches, baked beans, coleslaw, and other refreshments before shows begin and during a brief intermission. 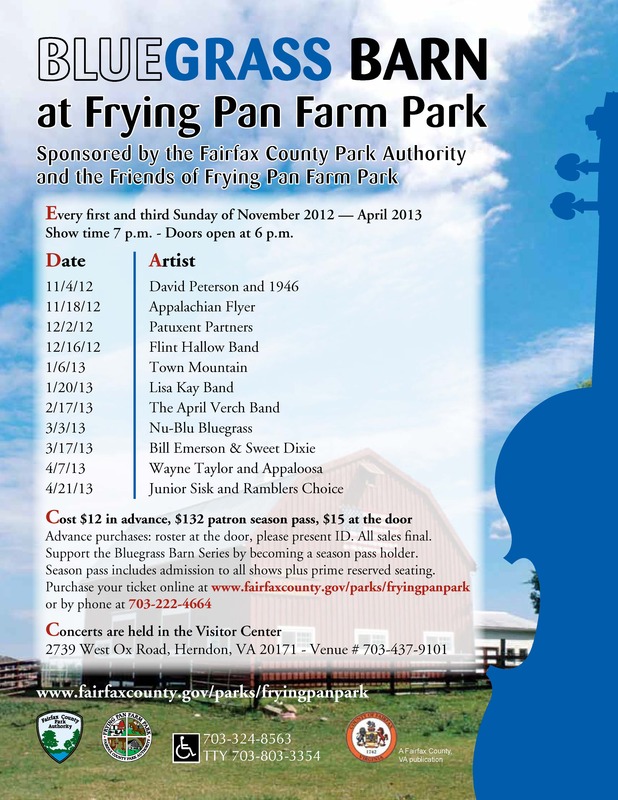 The Bluegrass Barn Series is sponsored by the Fairfax County Park Authority and the Friends of Frying Pan Farm Park. Bluegrass Barn concerts can be heard on the first and third Sundays from November through April. Doors open at 6 p.m. Concerts start at 7 p.m. Tickets are $12 in advance; $15 at the door. Season passes, which include admission to all shows and offer prime, reserved seating, are available for $132. Purchase tickets online, or call 703-222-4664. For more information, call 703-437-9101. Frying Pan Farm Park visitor center is located at 2739 West Ox Road in Herndon, Va. This entry was posted in Uncategorized and tagged Appalachia, Appalachian Flyer, Banjo, Bluegrass, Bluegrass Barn Series, David Peterson and 1946, Frying Pan Farm Park, Nashville on November 13, 2012 by Fairfax County Park Authority.